Fishline strives to create an environment that brings out the best in our volunteers and in those whom we serve. We are committed to building a volunteer program that provides ample and diverse volunteer opportunities for people of all ages, backgrounds, and ability levels. We value volunteerism in all its forms, from community service to employer-matched programs, and we seek to accommodate all who are willing to volunteer. We recognize that our volunteers are our greatest asset and honor them by integrating them into meaningful work at all levels of our organization. There may be no greater reward than to help assure your neighbor has enough to eat. At the food bank, everyone is in some way directly impacting the health and well-being of every visitor. Volunteer opportunities include drivers, sorting donations and stocking the market, and front market positions which help clients check in, shop and receive assistance. Our thrift store is operated entirely by volunteers, so all profits are used to provide services to Fishline clients. Volunteers can sort through donations, price and stage incoming merchandise or cashier. Nothing is more delicious then fresh picked vegetables straight from the garden. The Fishline Garden Program meets a rapidly growing need for emergency food assistance and increases the amount of nutritious quality food low income families have available to them. With the high cost of vegetables and fruits, gardening makes good sense and benefits us all. Come join us: growing and sharing fresh organic vegetables and fruit with our Fishline neighbors! Throughout the year, our agency is always busy. Whether it is the postal drive in the spring, school supply distribution in the fall or toys during the holidays, there is always a chance to help which doesn’t require a regular commitment. We also need administrative help throughout the year, for projects like our community newsletter, fundraising mailings or data entry. Lorie and Fishline volunteer Rose Marie’s dog, Toby. Lorie Brady, owner of Lorie’s Pampered Pups, came into Fishline to see whether our services might help her meet some basic needs. Although she owns her own dog grooming business, recent physical hardships have prevented her from working full-time. Not only that, but as an avid animal lover, the hiatus from working had her feeling down. Our Client Advocate, Sandra, suggested volunteering. Lorie lit up. She knew exactly how she could contribute. She brought her mobile grooming unit (still painted with its old name, Tails R Wagon) to Fishline to trim doggies’ nails, just before the holidays. It was a smashing success and she’s now coming 1-2 times per month! 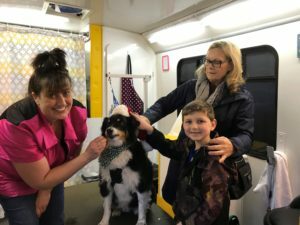 Trimming canine nails can be upwards of $15 per session and although necessary for some dogs, not exactly affordable for many who use Fishline. Lorie is providing her service to both clients of Fishline and volunteers, but more than that, she’s part of something bigger, something we can’t help but notice all day every day: people want to contribute. And, we believe that everyone has something to offer, however unique. Yes, we’re grateful for the services Lorie is providing, but we’re also grateful for her example. To schedule an appointment for nail trimming regardless of your ability to pay, please call Lorie at (206) 713-3701. Friday, March 8th from 9- 10 a.m.
Friday, March 22nd from 9-10 a.m.
Come learn more about Fishline’s current volunteer opportunities! We’ll provide an overview of our organization, talk about specific volunteer positions in our thrift store, food market, offices and tour our facilities. No need to RSVP. Coffee and treats provided.